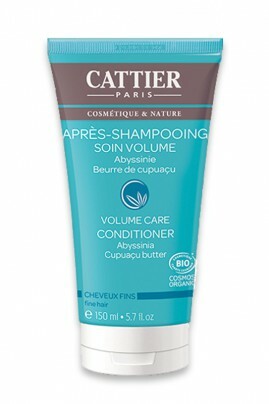 Volume Shampoo Cattier to the lusciously creamy texture denser and strengthens your hair mass. Thanks to the complex action creator of material oil Abyssinian Bio, your hair is deeply nourished and protected. With the Special Care Conditioner Volumizing Cattier, your hair is soft, glossy and full flexibility for an irresistibly silky touch! After your Volume Shampoo Bio Cattier, apply on your damp hair a nut of After-Care Volume Shampoo Cattier from your lengths to ends. Leave 2 to 3 minutes for maximum volume and then rinse with warm water.